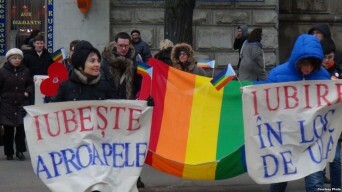 The Republic of Moldova, a country in Eastern Europe landlocked between Ukraine and Romania, overturned its “gay propaganda” ban on Friday in an effort to gain European Union membership. Having passed the legislation in June, lawmakers voted to repeal the clause that prohibited “relationships [other] than those linked to marriage and the family,” largely advocated for the by country’s Orthodox Christian majority, according to the AFP. The move comes in wake of international criticism surrounding neighboring Russia’s anti-gay “propaganda” legislation, which is currently paving the way for a bill that would remove the children of LGBT parents from their homes. The legislation hasgalvanized anti-LGBT activists in the country, enabling a pervasive climate of fear andalleged violence for LGBT citizens living within the former Soviet Union. Posted October 15th, 2013 & filed under News.